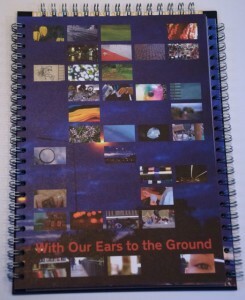 We have just received the first bound copy of our publication for With Our Ears to the Ground; a project by Proboscis commissioned by Green Heart Partnership with Hertfordshire County Council to explore peoples ideas about community. The project focused on four very different types of community in order to get a broad range of opinions across the county. I’m really excited to see the final version and especially happy with the middle tracing paper insert of scenes and people Orlagh and I encountered during the project. The book draws together the multiple layers of ideas and experiences we found across the different communities we met in Watford, Stevenage, North Herts and Broxbourne and it is designed to reflect the many ideas and voices we encountered. It is organised in the six themes of Transport, Movement, Listening, Community, Getting Involved and Perceptions the emerged during the project. The book contains drawings, photographs, quotes and writings. It can be read in any direction and you can interweave the pages of the three sections as you read, to find new perspectives. The With Our Ears to the Ground book, will go to selected libraries in Hertfordshire. The publication draws together the multiple layers of ideas and experiences we found across different communities and it is designed to reflect those ideas and voices. We have a small number of copies please contact us if you would like to acquire one. We have also published the main chapters as Diffusion eBooks – books to download print and make up published using Bookleteer. 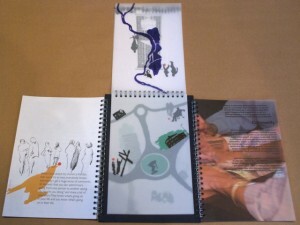 Booklets to make, carry in your pocket, browse in your own time, rather than read on screen. You can download them here.